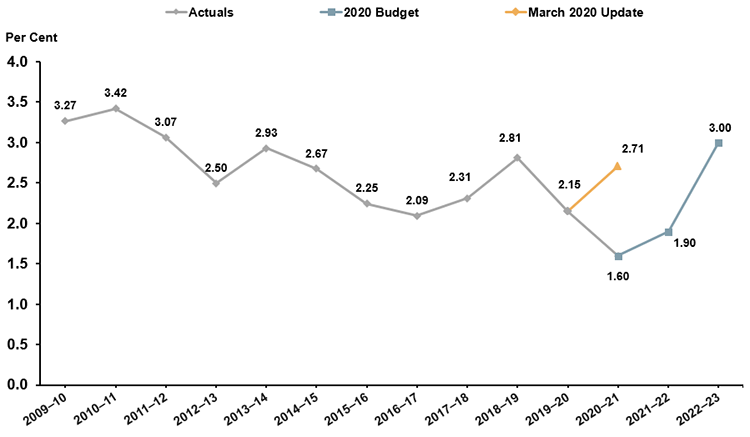 1 Interim represents the 2019 Ontario Budget projection for the 2018–19 fiscal year. Notes: Net Debt and IOD have been restated to include broader public sector, starting in 2005–06. Net Debt has been restated from 2001–02 for the adjustments resulting from the revised accounting treatment of jointly sponsored pension plans. Interest on debt is net of interest capitalized during construction of tangible capital assets of $165 million in 2015–16, $159 million in 2016–17, $157 million in 2017–18, $325 million in 2018–19 and $489 million in 2019–20. Note: Net Debt has been restated to include broader public sector net debt, starting in 2005–06.Net Debt has been restated from 2001–02 for the adjustments resulting from the revised accounting treatment of jointly sponsored pension plans. The forecast interest rates were used to project interest on debt over the medium term. Source: Public Accounts of Ontario (1990–1991 to 2017–2018), and Ontario Financing Authority. The Province's publicly-held debt consists of funds borrowed from the general public and institutional investors. As of March 31, 2019, Ontario's non-public debt was $11.0 billion, or 3 per cent of total debt. Non-public debt consists of debt instruments issued mainly to Canada Pension Plan Investment Board (CPPIB).